We have been a family company of Wharfedale roofers since 1963. Based in Ilkley, West Yorkshire, we’ve been providing high quality roof work to the Wharfedale area and Yorkshire region for nearly 50 years. For your peace of mind, we are members of the UK’s largest roofing trade association, The National Federation of Roofing Contractors (NFRC). As NFRC members, we take great pride in the quality of our workmanship, our expertise and knowledge and need to ensure that our roof work meets the high standards set by the association. Refurbishing over 50% of your roof? 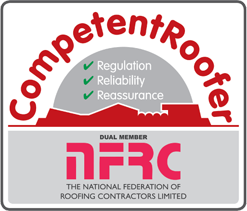 As a CompetentRoofer member, we are authorised to self-certify that our work complies with Building Regulations so you can rest assured that our work is safe. Click here for more reasons about why you should use a CompetentRoofer member. 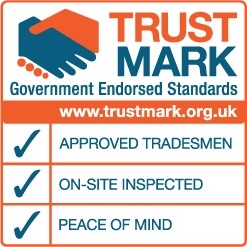 We are also TrustMark approved tradesmen which means our trading records and financial status is checked and our skills are also independently checked through regular on-site inspections. You also benefit from a 10 year guarantee for all roof refurbishments and new roofs under the TrustMark scheme. We enjoy a special relationship with our customers, providing professional and highly qualified Wharfedale roofers to sympathetically repair or renovate the roofs of older properties. New builds and extensions benefit from the supply and installation of a huge range of roofing materials. We also pride ourselves on the strength of our customer base built up through recommendations from our clients and professionals within the trade. We’ll perform a free roof inspection for you and can offer any advice or help you need together with a no obligation competitive quote for any roofing work you may need. Digital photos are provided with our free roof surveys to help explain the extent of any faults to your roof and the scope of work you require. If required, a further in depth survey may be carried out for a small charge however you’ll be advised if necessary. Please find time to browse our website which will show you the quality and high standard of our roof work. Call us on 01943 839032 to discuss your requirements and to arrange your free roof quote. We look forward to hearing from you.